Russell is currently an Adjunct Research Professor of Computer Science and an independent consultant; he can be contacted using Russ at ReliaSolve.com or on LinkedIn, Facebook, or Google+. Here is an academic resume from the spring of 2015. He is a co-founder of Redbud Labs, a microfluidic chip manufacturer. The company recently released MXR, a microfluidic mixer capable of accelerating molecular assays by 10x. Hi a also member of the board of directors for Pharaoh's Daughter, a nonprofit seeking to provide child care, training, and transitional housing for women who have children while in prison. He is the original developer (and through 2014 the principal maintainer) of the Virtual Reality Peripheral Network (VRPN) library. This public-domain software system provides local or networked access to various tracking, button, joystick, sound and other devices used in virtual-reality systems. He is also working with the OSVR team at Sensics to develop an open-source framework for VR. He was a Research Professor of Computer Science, Physics & Astronomy, and Applied Physical Sciences at the University of North, Carolina at Chapel Hill through the January 2015 where he was named UNC Inventor of the Year for 2014. 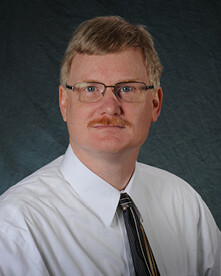 During this time, he was the co-director of the UNC NIH National Research Resource for Computer Integrated Systems for Microscopy and Manipulation. His research interests include Scientific Visualization, Distributed Virtual Worlds, Haptic Display, and Interactive 3D Computer Graphics. All of these came together in his role as the director of the computer science team in the UNC Nanoscale Science Research Group, which is a team of Physicists, Chemists, Gene Therapists, Biologists, Library Scientists, Perceptual Psychologists, and Computer Scientists working together to develop improved interfaces for scanned-probe and other microscopes. These tools enable scientists to see, touch and manipulate nanometer-scale objects like viruses and carbon nanotubes, either from within the laboratory or across a computer network. Russell taught a course on Visualization in the Sciences each spring, aimed at both computer scientists and natural scientists. It was last offered as Comp 715, Physics 715, and Materials Science 715 in the spring of 2014; YouTube videos of the lectures are available online here. (It was also taught in the springs of 2013, 2012, 2011, 2010, 2009, 2008 and 2007.) It was cross-listed as Comp 215, Physics 215, and Materials Science 215 in the spring of 2006 (co-taught by David Borland as the cross-listed CSE 704 at NC A&T) and 2005. It was taught as Comp 290-069 in the fall semesters of 2003, 2002, and 2001. If you are interested in teaching this course, contact him for copies of the lecture materials and videos of the lecture. Along with Amit Chourasia, Russell was co-chair for the 2008 IEEE Visualization Design Contest. and the 2006 IEEE Visualization Design Contest. He was the chair of the 2012 IEEE Scientific Visualization Conference. Flexible Occlusion Rendering technology (available for license). Vertex and fragment shader code to repidly render perfect spheres, cylinders, other quadric objects, and other non-polygonal objects on graphics hardware. This should be of particular use in rendering molecular graphics. Some lessons I learned the hard way. Beacons on the Hill, UNC Christian Faculty page that he helps maintain. Includes links to campus groups and faculty. What is the Evidence, a web page dedicated to describing the harmony between science and Christianity, with pointers to useful books on the subject, 1-page posters, and other resources.